Fusion energy has long been known to be the best possible means to provide power to mankind. It is fusion energy that powers the stars - including our own sun. The fusion reaction produces ten million times more output power than chemical reactions, and the fuel needed is found in seawater - it is essentially an unlimited supply that will last for billions of years at present consumption rates. Additionally, the fusion reactions produce no long lived nuclear waste, there is no possibility of run-away nuclear accidents, it produces no materials capable of building fission bombs, and there are no greenhouse gas emissions from fusion reactions. With such tremendous promise, fusion energy research was begun with the expectation of quickly bringing all of its advantages to mankind. Unfortunately, that promise has not yet been reached. To understand how fusion energy promises to overcome the many worrisome problems associated with traditional nuclear power, as well as to understand how both fission and fusion work, it is helpful to look at the underlying reactions that power each alternative. In the picture above, a neutron collides with a Uranium nucleus. When it does so, it causes the Uranium nucleus to split, producing two smaller daughter nuclei as well as neutrons and considerable energy. Those neutrons then go on to hit more Uranium nuclei. And since more neutrons are formed than are absorbed, a chain reaction can occur resulting in more and more energy being released. If the density of the Uranium is too high, this can produce an explosion. (This is the basis for nuclear bombs). If the Uranium density is too low, the neutrons escape without hitting additional Uranium and the process stops. To get nuclear energy out of fission, the density and other conditions must be just right. That is why fission energy has had somewhat of a troubled history. Further, a significant number of the daughter nuclei are themselves radioactive, leading to a problem of nuclear waste. Lastly, there is only so much Uranium on the planet, and therefore traditional fission energy is not a long term solution to our energy needs. In fusion (pictured above) a nucleus of hydrogen containing one proton (orange) and one neutron (brown) collides with a nucleus of hydrogen containing one proton and two neutrons. When they collide, they produce a helium nucleus (with two protons and two neutrons), a free neutron, and lots of energy. 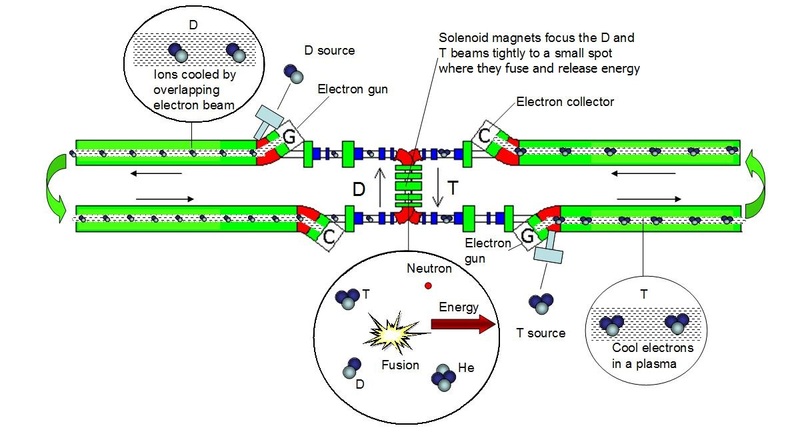 Hence, fusion power will be safe, since it is not based on controlling a chain reaction like what we've seen with fission. There are no long-lived nuclear waste products produced. And the fuel - hydrogen - is enormously abundant, since it is found in water. Unfortunately, the fusion reaction only occurs in significant quantities at a very high temperature, similar to the temperatures that exist on the sun, and this has caused significant engineering difficulties. We'll now look at a couple of technologies that attempt to overcome the problems involved in operating at such high temperatures. The Tokamak. The leading candidate for a fusion reactor is the tokomak, shown below. 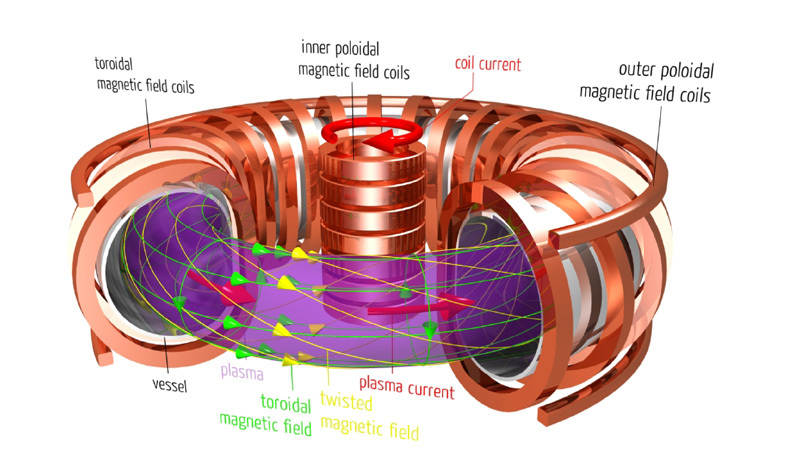 A tokamak contains charged particles with magnetic fields and heats those particles to the high temperature needed. After heating them, a very small percentage of the particle collisions will have the optimum energy for fusion to occur. Unfortunately, the majority of the collisions between the stored particles results in so many particles escaping the containment that to date the associated power loss is far too great for the tokomak to be a viable power source for humanity. ECOFusion proposes using the science of particle beams to collide beams of particles. The beams are directly accelerated, rather than relying on heat. Hence, ECOFusion brings all of the reactants to the correct energy for fusion to occur, which is a tremendous advantage over the tokamak. Just as in a tokomak, most of the collisions do not result in fusion and there are adverse effects of near-miss collisions that must be handled. ECOFusion handles these adverse effects by the process of Electron Cooling, wherein an electron beam is laid on top of the ion beams, taking away all of the unwanted ion beam motion. ECOFusion is a serious new approach to one of mankind's most vexing problems, as it holds out the promise for safe, clean, inexhaustible power. We are presently looking for funding to build the first prototype, which is expected to cost about $10 million to $20 million and take two to four years to construct. If you would like to watch videos about ECOFusion, you can click here for some introductory videos or click here for a scientific presentation of ECOFusion! If you would like to read an overview of ECOFusion, including a possible proposed way of building the first prototype, click here. To contact us, send us an email at info@ecofusionpower.com.